This is a beautiful whole 30 approved meal that comes together quickly and looks fancy. Impress and don't even break a sweat. Heat a heavy cast iron skillet over medium high heat on the oven until smoking hot. Meanwhile, pat the samon dry and sprinkle a heavy coating of blackening season evenly over it. Season with salt and pepper if desired. Place the salmon, with the skin side up in the hot pan, and allow the salmon to 'blacken', cooking until there is a solid crust from the seasoning and the salmon pulls from the an without tearing. Flip and allow the salmon to cook through, skin side down. Meanwhile, toss the minced cucumber, red onion, and mango in a small bowl. Add the olive oil and toss to combine. Make the slaw by tossing the cabbage and onion. Add the apple cider vinegar and red wine vinegar, season with salt and pepper and toss to combine. As the salmon comes together, mash the avocado and stir in the mayo, salt and pepper and chopped chipoltes. 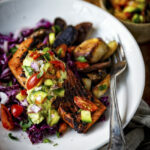 Arrange the dish with cabbage slaw, roasted fingerlings (if serving), with the salmon on top. Spoon the avocado creama over each and top with a dollop of the mango salsa.